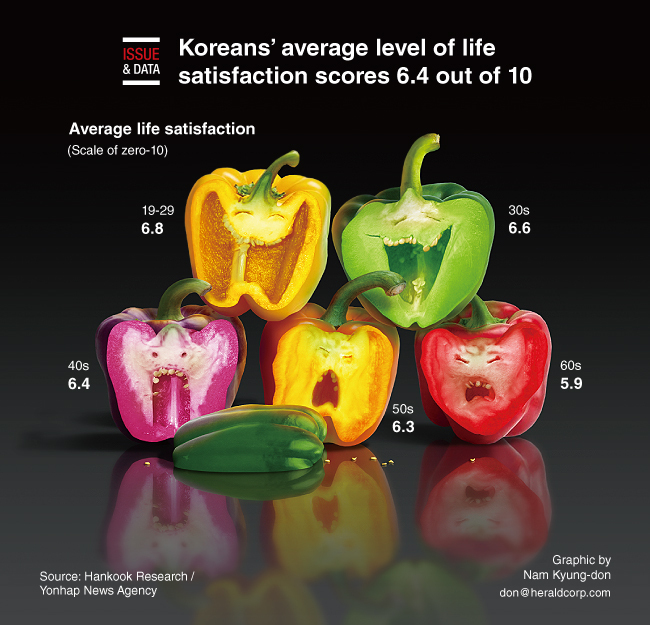 Koreans gave an average score of 6.4 on a scale of zero to 10 for the level of satisfaction with their quality of life, a government survey showed. The Ministry of Culture, Sports and Tourism commissioned Hankook Research to conduct the inaugural survey on 1,500 adults from May 15-21. Respondents were asked how satisfied they were with their lives. According to the survey, the level of life satisfaction was inversely proportional to age. People aged 19-29 were most contented with their lives, with an average score of 6.8, followed by people in their 30s (6.6), those in their 40s (6.4), those in their 50s (6.3) and those in their 60s (5.9). Single-person households were found to have the lowest satisfaction with an average score of 6, while four-member households had the highest with 6.6.